If you're a global or SharePoint admin in your organization, you probably want to control who can make changes on your site. For example, you might want employees in Finance to be able to edit lists, but employees in Marketing to only view those lists. That's where permissions and permissions levels come in. Permissions allow SharePoint users to perform certain actions, such as edit items in a list or create a site. But you can't assign individual permissions to individual users in SharePoint. Instead, you group related permissions together into a permission level. Then you assign that permission level to a SharePoint group that includes the people you are assigning permissions for. 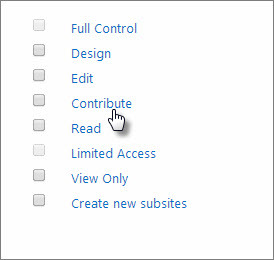 SharePoint comes with some default permission levels that you can use, such as Contribute and View Only. But if one of those doesn't meet your needs, you can create a new permissions level. It's easier to keep track of permission levels if you don't change the defaults. You create and make changes to permission levels on the Permissions Levels page. To create or make changes to permission levels, you must belong to a SharePoint group that includes the permission to Manage Permissions. By default, you have this permission if you belong to the Owners group or if you are a Site Collection Administrator. 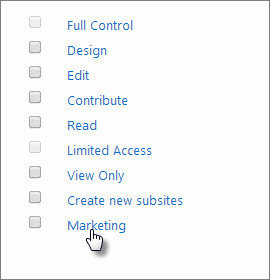 On the top-level site of the site collection, click Settings . For a Classic site, click Site Settings. On the Site Settings page, in the Users and Permissions section, choose Site permissions. For a Modern site, click Site Permissions followed by Advanced permissions settings. On the Permissions tab, in the Manage group, choose Permission Levels. On the Permission Levels page, choose Add a Permission Level. On the Add a Permission Level page provide the name and the description. In the Permissions area, select the check boxes next to the list, site, and personal permissions that you want this permission level to include. You can make changes to any of the listed permissions levels, except Full Control and Limited Access. 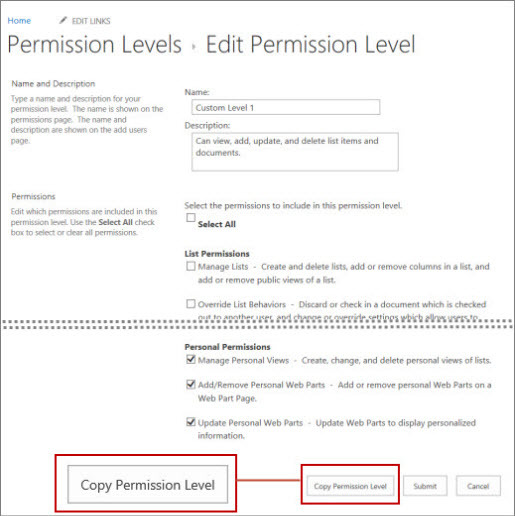 After you create the permission level, assign it to a SharePoint group. A quick way to create a new permission level is to make a copy of an existing permission level. You might want to do this when the existing permission level has permissions similar to what the new permission level will have. After you make the copy, you can add or remove the permissions you need the new permission level to have. On the Permission Levels page, click the name of the permission level that you want to copy. Be sure to click the link; do not select the checkbox next to the name. For example, Contribute, as shown in the following figure. On the Edit Permission Level page, choose Copy Permission Level, which is at the bottom of the page after the Personal Permissions section. On the Copy Permission Level page, type a name and description for the new permission level. We recommend that you don't make any changes to the default permission levels that come with SharePoint. You can't make changes to the Full Control and Limited Access default permission levels. On the Permission Levels page, click the name of the permission level you want to edit. Be sure to click the link; do not select the checkbox next to the name. For example, Marketing, as shown in the following figure. Add or remove permissions to the level. You can delete any permission level, except for Full Control and Limited Access. We don't recommend that you delete a default permission level. To delete a permission level, on the Permissions Levels page, select the check box next to the permission level that you want to delete, and then chose Delete Selected Permission Levels. Don't edit default permission levels If you change a default permission level, the changes affect all the built-in SharePoint groups within the site collection. It can also cause confusion if you have two site collections that have permission levels with the same name, but each contains a different set of permissions. Don't delete default permission levels If you delete a default permission level, it will be removed from all built-in SharePoint groups that contain it within the site collection. This can cause users assigned to those groups to lose critical permissions. Assign permission levels to SharePoint groups You can assign a permission level to a single SharePoint user, but it's easier to keep track of who has permissions to which sites if you assign permission levels to a SharePoint group, and add that individual to the group. This can also help site performance.